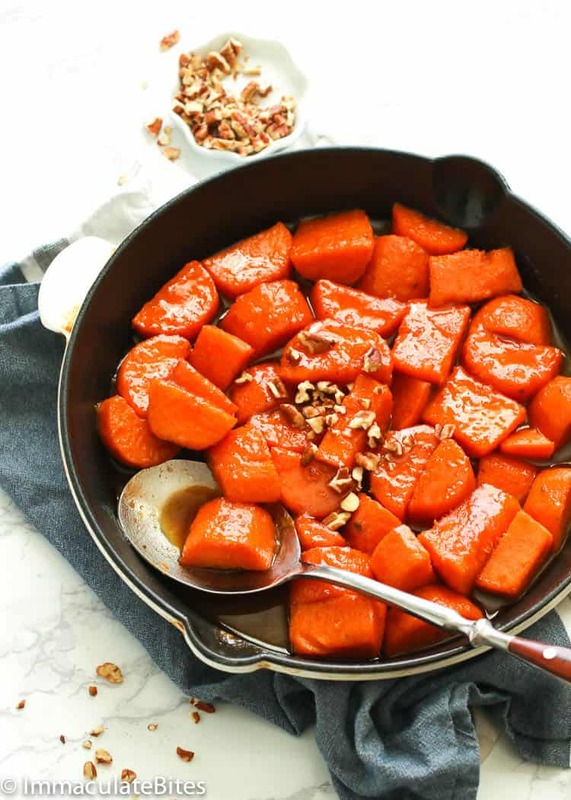 Candied Sweet Potatoes – tender sweet potatoes bathed in a glossy fragrant buttery brown sugar glaze with a zesty hint of lemon and orange. Can be served as a holiday side dish or as a dessert! Hello, November! How can you steal those months so eagerly? Or is it just me who lost track of time? So I started my holiday recipe spree this last quarter with this pretty boozy Rum Cake with rum glaze, this traditional Puerto Rican wrapped treat Pasteles and with my Creamed Spinach yesterday. See how colorful your Thanksgiving and holiday table would be? And it gets better than that! For today’s recipe, I’ve added a pretty pop of orange side dish to your table which can also double up as a holiday dessert. 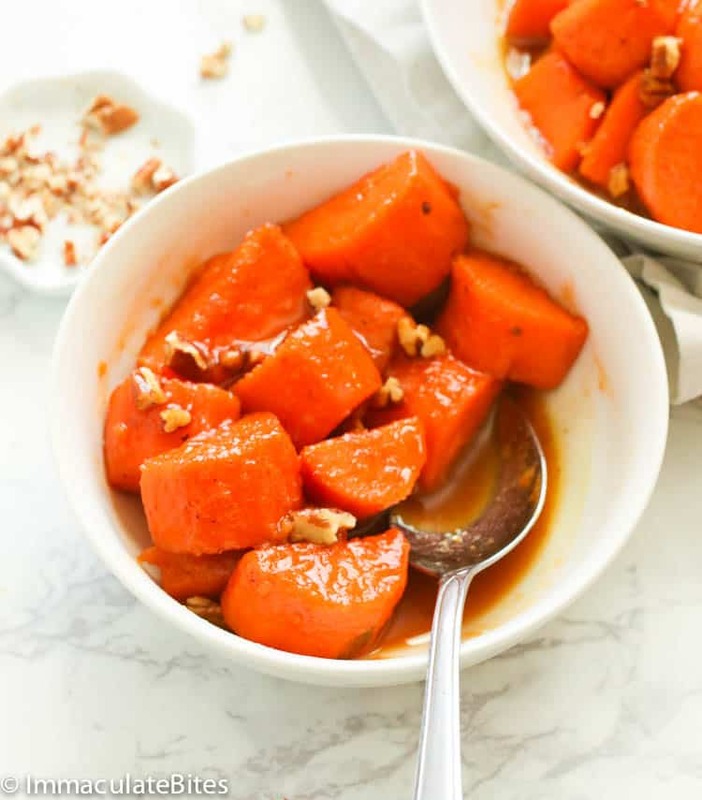 Moreover, this candied sweet potato here makes a great sweet side of wholesome veggies. What makes this extra special are the flavors that coat very well in every sweet potato chunks – cinnamon, ground ginger, nutmeg and vanilla. However, as much as I’d like to stick to the traditional recipe, I’d love to add my own personal touch in this dish. Presenting the Candied Sweet Potatoes version 2.0. Aside from the brown sugar, I added 2 tablespoons of maple syrup for an extra depth of sweetness. I also squeezed in some lemon and orange juice in it to balance the sweetness. The result??? 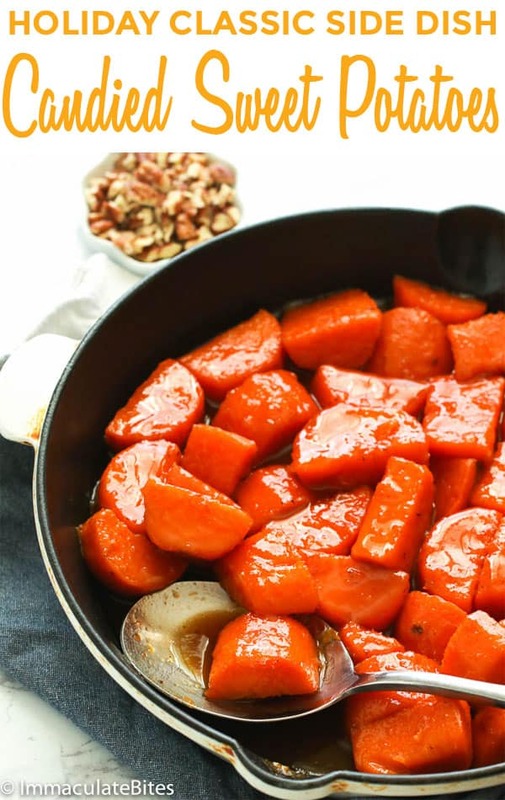 A skillet of heavenly candied sweet potatoes! 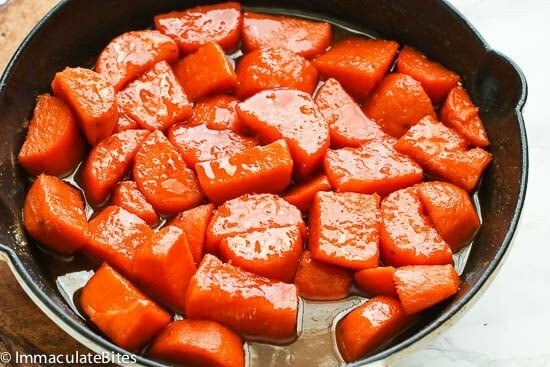 How do you make candied sweet potatoes in the oven? Most recipes for candied sweet potatoes would call to baking them in the oven for around 350-375 degrees F for an hour. Sliced yams are bathed with a sugar glaze in an aluminum foil-covered baking dish and baked to around 30-40 minutes. The foil is then removed and baked for another 20 or 30 minutes. Well, actually, there is a shortcut version to that which guarantees tenderly cooked sweet potatoes. 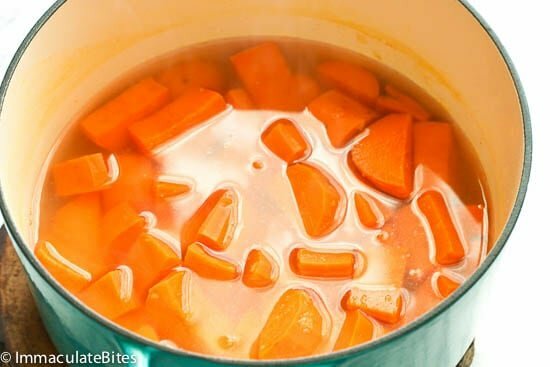 What I do is to boil the sweet potatoes first until almost tender, otherwise, they take much time to cook in the oven or in the skillet. 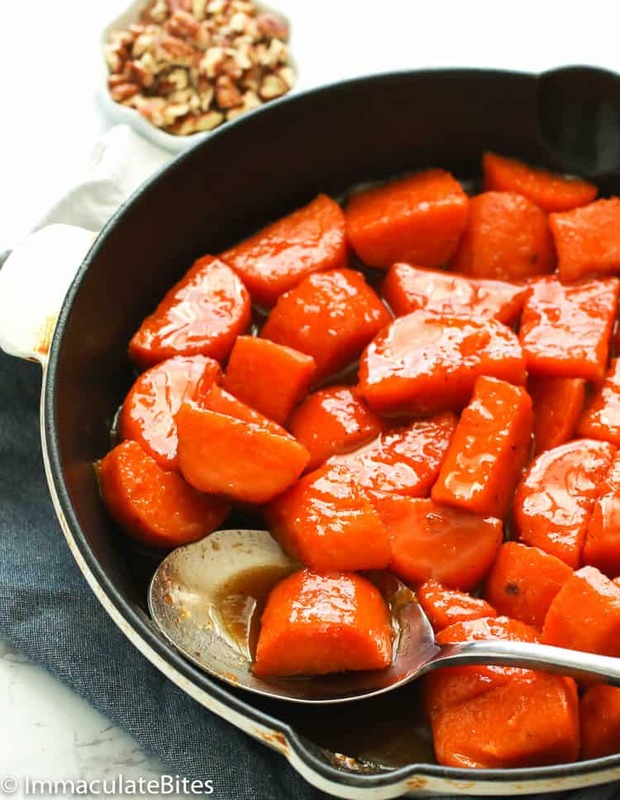 Since they take much time to cook, you risk of having sweet potatoes with a raw center and a burnt glaze which makes the whole dish bitter. We don’t want that! 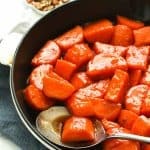 I know you also love this Sweet Potato Casserole for the holidays, but you can always give this easier sweet potato recipe a try. Or you can even prepare it whenever you want as a dessert topped with your favorite ice cream. Don’t cut your sweet potatoes thinly. The thinner they are, the more likely they are to get mushy. 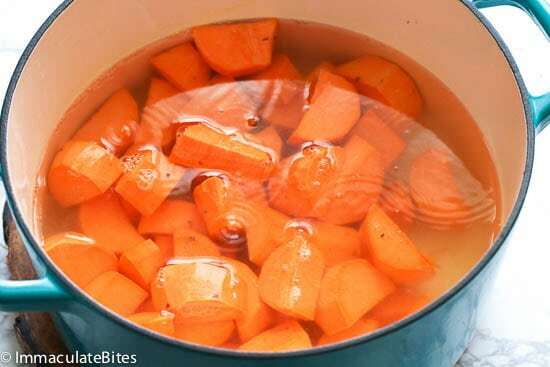 Sweet potatoes can be boiled ahead a day in advance. Cool it on a temperature after boiling and then store it an airtight container in the fridge. For any leftovers, store it in airtight container and place in the fridge for up to 3-4 days. 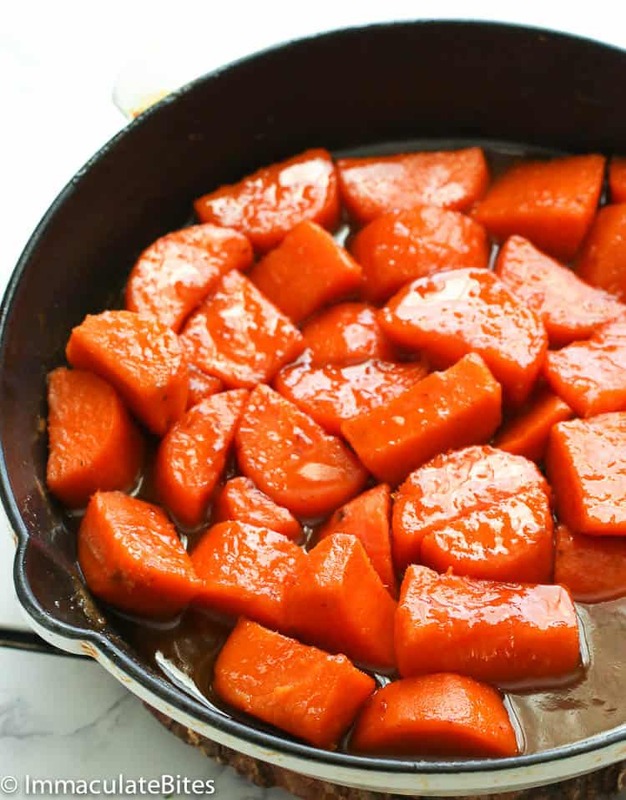 Candied Sweet Potatoes - tender sweet potatoes bathed in a glossy fragrant buttery brown sugar glaze with a zesty hint of lemon and orange. Can be served as a holiday side dish or as a dessert! 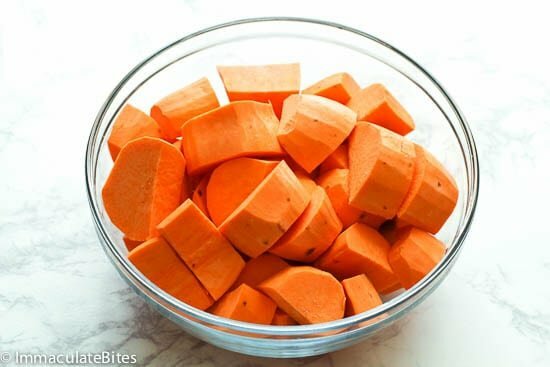 Peel the sweet potatoes and cut them into big chunks, about 1/3″ inch thick– try to cut them big; the thinner they are, the more likely they are to get mushy. Add to pot or dutch oven, add enough water to cover it , lightly salt. Bring to a boil and cook until almost tender – a little hard on the edges. Sweet potatoes will continue cooking in syrup. Test with a knife – cooking time varies depending on size of potatoes . While sweet potatoes are cooking .Heat a large skillet over medium heat add butter, granulated sugar, brown sugar, orange and lemon juice. Quickly stir to combine . Then add nutmeg, ground cinnamon, allspice and ground ginger. 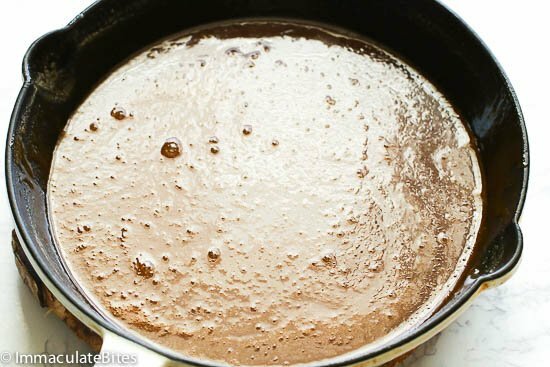 Continue stirring until syrup start to bubbles and it thickens up. This might take about 3-4 minutes. Add sweet potatoes and turn the sweet potatoes about every few minutes to coat on both sides, until potatoes are tender and glaze is thicken to likeness. About 7 minutes or more . Salt if desired. Stir in the vanilla just before removing skillet from the stove. Serve warm with sauce, if any and sprinkled with pecans, if desired. Peel the sweet potatoes and cut them into big chunks, about 1/3″ inch thick. Try to cut them big; the thinner they are, the more likely they are to get mushy. Add to dutch oven or pot full of water. Bring to a boil and cook until almost tender – a little hard on the edges. Sweet potatoes will continue cooking in syrup. Test with a knife – cooking time varies depending on size of potatoes . 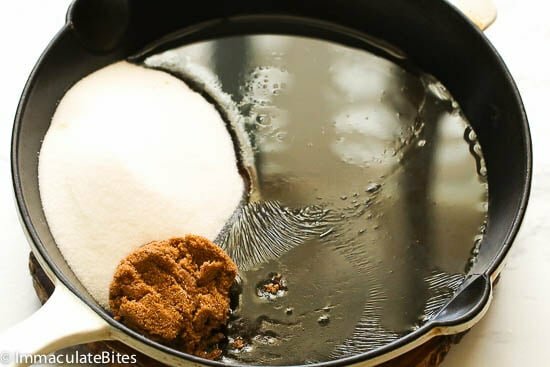 Heat a large skillet over medium heat add butter, granulated sugar, brown sugar, orange and lemon juice. Quickly stir to combine . I’m confused, you have a recipe for sweet potatoes (which was lovely by the way), but then list the ingredients & refer to yams; sweet potatoes are not a type of yam & yam is not a type of sweet potato, they are not related & all the African restaurants in my country (the UK) & most of Europe do not confuse them. You also refer to ‘holiday’ meals, you mention Thanksgiving separately, but not Christmas, that’s relegated to ‘holiday’. As to the cooking, I had not tried anything like this before; I thought of ‘candy’ as American sweets for children, sugary jelly things. I have found out though that U.S. ‘Southerner’s’ like their SUGAR!!! i made the recipe as stated though & found it went very well with cold chicken, nut roast & green/white/red cabbage, peas & roast potatoes. It was interesting that you suggested this could be a dessert, some years back, a cookbook about 300 yrs old (about the time the British poor were emigrating to the U.S.) was found, there were deserts in it with carrots/parsnips, obviously desserts because of the amount of sugar used & the vegetables were encased in sugary pastry with custard, or left open. It shows how times change & sometimes how old customs continue in a new country. I’ve never left a comment before but I love all the recipes I’ve tried of yours!! Agree . 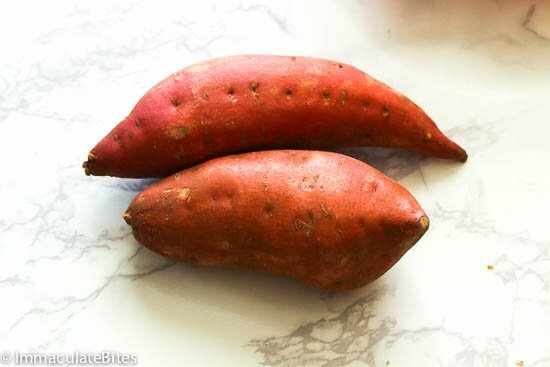 Sweet potatoes and yams are sometimes used interchangeably and often mislabeled in most supermarkets in the US.It’s sometimes hard to tell the difference, especially if you are getting the orange variety. They are definitely not related . “Real” yams are the ones grown in tropical countries- Africa in particular- real starchy , white or yellow in complexion. Christmas is a Holiday too! One of my favorite times of the year , especially as a child . Am so honored that that you would take time out to share your thoughts with us. Annd SUPER happy that you gave it a try ! Actually I had a discussion with a couple of US farmers and they said in the US “Yams” are a cousin of sweet potatoes that do not get mushy when you cook them. Kind of like the ones in Cameroon which stay firm after boiling. Meanwhile sweet potatoes in the US become extremely soft and easily mushy when you cook them. A good analogy for when in the US is to treat sweet potatoes like banana, while yams are like plantains in terms of consistency after cooking.